Saying goodbye is never easy, even when you’re just saying goodbye to a car. After all, you and your car have been through a lot together. First dates, epic road trips, dropping the kiddos off for their first day of school… plus commuting, commuting and… more commuting. What can I do to make my car worth more? Have I done enough over the past several years to maintain some value? Have I made any mistakes that could cost me substantially? Selling a car can, and in most cases, should, take just as much work and research as buying a new car, even if you just plan on including it as a trade-in on your new purchase. Car depreciation happens and it happens quickly. 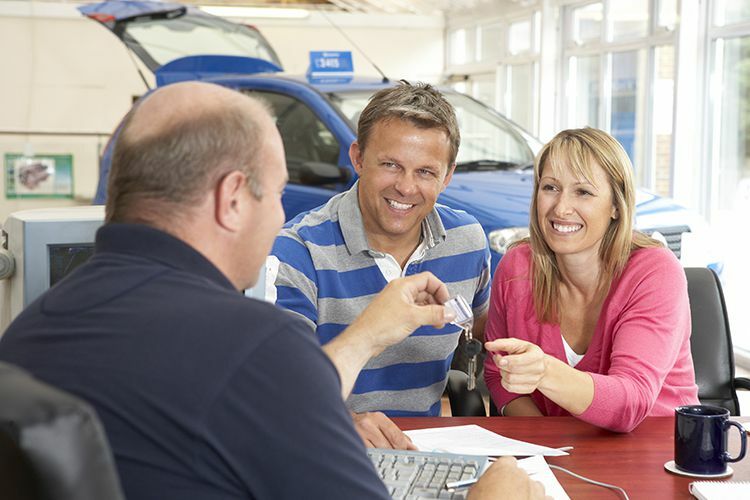 It has been said time and again that the second you shake your car dealers’ hand and drive off the lot your vehicle loses up to 20% of its value. In the first year of ownership, cars depreciate 30%, and for certain models, depreciate can accrue at up to 65% in the first three years. Personal upkeep is a huge factor in determining car trade-in value, and keeping your car in top-notch condition can be the difference between selling a car at a price you can live with and driving away from the lot feeling exploited, when in reality, this one was on you. Below are five factors that affect car trade-in value and things you as a vehicle owner can do to make your car worth more when the time comes to sell. Mileage matters. If your vehicle has more than 100,000 miles on it, that is a red flag for potential buyers. Even if your car has been dependable over 200,000 miles with relatively few problems, resale value is going to take a huge hit. The average person puts between 12,000 and 15,000 miles on their vehicle in a given year. If you have a long commute and go above that average, chances are good that your car has been driven fairly hard, and mechanical issues are more likely to occur. Just because it hasn’t happened to you doesn’t mean your vehicle isn’t a ticking time bomb. Planning a big trip? Consider renting a car instead to save mileage. Regular maintenance is a must, not only to provide reliability now, but increase resale value in the future. Follow your manufacturers’ recommended maintenance schedule including oil and filter changes. Be sure to keep all maintenance records, no matter how minor, and have them handy when selling a car to show how well you took care of it over time. Do you drive with your check engine light on? Your car is trying to tell you something. The longer you drive a damaged vehicle, the higher you should expect the repair bill to be. Keep in mind that repairs don’t provide an excellent return-on-investment, especially if your vehicle has been involved in a serious accident. For every $5,000 in repairs due to an accident, expect your vehicle value to be cut in half, by $2,500. Vehicle buyers are interested in options that make their lives easier and provide safety and comfort. Not all vehicle options are created equally, and when buying a new car, consider adding options that are proven to have a positive influence on resale value. Buyers want: Automatic transmission, power windows, power locks, anti-lock brakes, cruise control, remote start, leather seats (if taken care of, properly) entertainment, navigation systems and sunroofs. Buyers don’t want: aftermarket and performance-based accessories. Automatic transmission almost pays for itself when it comes to selling a car. Unless you are selling a vintage sports car that thrives on manual transmission, the simplicity of automatic transmission in day-to-day driving sells. Automatic locks and windows can also make a big difference in selling power. In 2016, no one wants to crank windows manually. Leather seats also give vehicle owners a sense of luxury. One huge thing to avoid in hopes of maintaining vehicle resale value is aftermarket accessories. While a $2,000 set of 22” chrome rims or an expensive aftermarket stereo may seem like good investments, you won’t be getting your money back. Some performance-oriented add-ons affecting suspension or safety features may nullify warranty coverage. That expensive radio may be obsolete when it comes time to sell as well. Another thing to consider when buying a car that could impact your resale value down the line is the color of your vehicle. Neutral colors, like black, white and silver never go out of style. While upgrading to that limited edition lime green color seemed like a good idea at the time (everybody loved it! ), it’s going to be harder to sell and will have a lower resale value than a neutral-colored vehicle. People want to buy cars that have been taken care of properly. While buyers may overlook a spot here or a spot there, a larger problem can arise. Buyers can think “if this person can’t take the trash out of their car, can I trust that they took care of the vehicle mechanically?” This a warning sign buyers won’t take lightly. Before trading in your vehicle or selling it privately, make an effort to restore the interior of your vehicle to appear as like-new as possible. There are several great products and services that specialize in odor removal, and Dent Wizard offers a full suite of interior repair solutions, including carpet dyeing and repair, console and dashboard repair, leather repair, seat repair and vinyl repair. These deficiencies in a vehicle’s interior appearance can decrease resale value by thousands of dollars, making restoration, even if you have the intent on selling, an excellent return-on-investment. A ding or dent may not seem like a big deal to you, but appraisers are picky people. Used vehicles are usually graded by appraisers on a four-point scale, with cars graded as either Excellent, Good, Fair or Poor condition. Just one or two small dents, dings, paint scratches or chips can be the difference between “Fair” or even “Good” or “Poor.’ It’s best to park in a garage out of the elements whenever possible, but if not, “dings and dents happen.” It’s part of owning a vehicle. Before trading in your vehicle, have it professionally washed and take care of all dings and dents, as well as any other exterior deficiencies which can diminish resale value. If you’re serious about maintaining your resale value, Dent Wizard offers Paintless Dent Repair, along with a full line of exterior repair services. These services are affordable, and can provide an immediate return on your investment upon resale. Also, remember to remove all bumper stickers and trash before selling a car. You can’t control everything when you sell your vehicle, but the market is definitely something to be mindful of. Nobody is going to want to buy a convertible in Anchorage and nobody is going to want to purchase a pickup truck in Miami. Some vehicles depreciate at a lower clip than others. Subaru, Honda, Hyundai, Mazda and Toyota are brands that generally have a reputation for maintaining their value. Like everything else in life, supply and demand is king. Even if you are selling a Camry, a dealership isn’t going to be impressed if they already have 12 used Camrys on their lot. Some of the most popular used vehicles are the same model as vehicles that are popular now. If your vehicle is new enough to have the same body style and design as the new models, you could net an even higher resale value. We all want to get the most out of our investments, and in many cases, your vehicle is your second most valuable asset aside from your home. Protect it now, and in the future, even if its future is with someone else. Dent Wizard offers many services designed to help maintain and even improve your vehicle’s trade in value. Specifically, Ding Shield by Dent Wizard is a service plan designed to keep your vehicle looking great. How have you benefited from preparing your vehicle for resale? Have a story you would like to share with us? Share your experiences with us on Facebook or Twitter! Dent Wizard is the world leader in total automotive SMART (small to medium area repair techniques) services, both inside and out. Visit us online at http://www.DentWizard.com today to learn more about how our services are designed to enhance your vehicle’s trade-in value!